MIAMI, Aug. 15, 2017 /PRNewswire/ -- Carnival Corporation & plc (NYSE/LSE: CCL; NYSE: CUK), the world's largest leisure travel company, today released its 2016 sustainability report as part of the launch of its new dedicated sustainability website. The report and complementary site detail the company's sustainability efforts and the progress made in 2016 toward its 2020 sustainability performance goals. The report was prepared in accordance with the Global Reporting Initiative (GRI) G4 "core" level, and a full copy can be downloaded from Carnival Corporation's new site. 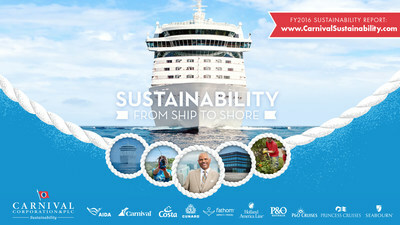 In 2015, Carnival Corporation announced its 2020 sustainability goals, establishing 10 goals for reducing its environmental footprint while enhancing the health, safety and security of its guests and crew members and promoting sustainable business practices among its brands, business partners and suppliers. The 2016 report and website, Sustainability from Ship to Shore, confirm the company is ahead of schedule on reducing its carbon intensity and is on track to meet its additional sustainability goals during the next three years across its 10 cruise brands. "We take our commitment to sustainability and the environment very seriously and take proactive measures to ensure that sustainability is ingrained in the core of our business practices," said Bill Burke, chief maritime officer for Carnival Corporation, whose industry-leading cruise lines sail to more than 760 ports around the world. "Our top priority is to consistently exceed our guests' expectations for a great cruise vacation – and that includes providing an exceptionally safe, comfortable and enjoyable environment for our guests and crew members, while at the same time maintaining our deep commitment to protecting the oceans, seas and destinations we visit." Added Burke: "We have a great team of employees, most of whom work and live at sea, and we all understand a healthy environment is not just an operating necessity, but it is also the right thing to do. We want our guests to be confident that when they book a cruise vacation with one of our brands, they are doing so with a responsible global corporate citizen." As part of the site, Carnival Corporation's president and CEO Arnold Donald invites readers to join the cruise company on its sustainability journey through a welcome video that highlights key elements of the company's commitment to sustainability. On the new site and report, easy to read messaging – enhanced by colorful graphics, engaging photos and videos – provides updates on progress made during 2016 in sustainability performance. The report was designed to share sustainability practices with stakeholders, including the company's employees, the millions of guests who cruise with Carnival Corporation brands and investors. Being ahead of schedule in achieving a nearly 25 percent reduction in CO2e (equivalent carbon dioxide) relative to the 2005 baseline. Pioneering the use of LNG (liquefied natural gas), the world's cleanest burning fossil fuel, and introducing the first cruise ship ever fueled with LNG from trucks while in port. Continuing to make progress in installing Exhaust Gas Cleaning Systems, which significantly improve air emissions by reducing sulfur compounds and particulate matter from engine exhaust – by the end of 2016, 59 percent of the fleet was equipped with the systems (and a larger percentage is equipped with the systems as of today). 40 percent of the fleet was equipped with cold ironing capabilities by the end of 2016, which allows ships to use an alternative power source while in port. Carnival Corporation and its brands implement extensive measures to deliver on its commitment to continue to keep guests and crew members safe and comfortable, protect the environment, develop and provide opportunities for its workforce, strengthen its stakeholder relations and enhance the communities in which the company visits and operates. Those measures are detailed in the company's 2016 sustainability report. As part of the company's commitment to reduce air emissions and improve air quality in the environments where its ships visit, Carnival Corporation pioneered the use of LNG with the introduction of the AIDAprima in 2016. AIDAprima is the first cruise ship in the world with a dual-fuel engine that can be powered by LNG while in port. The company will continue its efforts to pioneer use of this clean-burning fuel with seven next-generation ships on order that will be powered by LNG while in port and at sea. The company also signed an agreement with Shell to supply LNG. Expanding its partnership with Wärtsilä to include a long-term diesel engine maintenance agreement with an energy-efficiency component. Continuing installation of Exhaust Gas Cleaning Systems (EGCS), which significantly reduce sulfur compounds and particulate matter from ship engine exhaust. Making a significant commitment to its employees in terms of high-quality training by establishing the new Arison Maritime Center, home of the Center for Simulator Maritime Training Academy, also known as the CSMART Academy. Opening the second of three planned state-of-the-art Fleet Operations Centers (FOC) in Seattle with the most advanced ship-to-shore communications technologies available to assist captains, chief engineers and deck and engineering officers with digital support, control and planning of all nautical and technical operations. Another key milestone for the company in 2016 was the launch of Fathom TRAVELdeep™ volunteer experiences benefiting local communities across a number of brands. Last year, Fathom guests participated in several impactful sustainability projects in Puerto Plata, Dominican Republic – including reforestation efforts, recycling paper, and encouraging crafts entrepreneurship and a water filtration program. The company is exploring the potential to expand the volunteer activities to other areas around the globe in 2017. As the company continued its efforts to achieve a diverse and inclusive workforce and to provide all employees with a positive work environment, Carnival Corporation developed, published and implemented an anti-slavery and human trafficking mission statement to further support human rights efforts in the global communities in which the company's employees and their families live. Carnival Corporation also revised its corporate Health, Environmental, Security and Security (HESS) and Sustainability policy and initiated the implementation of a diversity council. In 2016, Carnival Corporation continued its partnership with The Nature Conservancy (TNC), one of the world's leading conservation organizations, with its $2.5 million financial commitment over a five-year period, which started in 2014 to support important research for marine conservation. Continued partnership with the Big Brothers Big Sisters program. Support of the Smithsonian National Museum of African American History & Culture with a $2 million donation over a five-year period. Ongoing memberships with the Maritime Anti-Corruption Network (MACN), the Global Environmental Management Initiative (GEMI) and a new partnership with the U.S. Wildlife Trafficking Alliance to support their programs to reduce the demand for illegal wildlife products. In June, Carnival Corporation was recognized for producing the year's most engaging and informative 2015 sustainability report in the 10th annual Corporate Register Reporting Awards, the only annual global awards program honoring excellence in corporate social responsibility and sustainability reporting. Recognized for the third consecutive year as among the best places to work for LGBTQ equality by the Human Rights Campaign. Named by Black Enterprise Magazine as one of the 50 best companies for diversity for its commitment to an inclusive and diverse workforce. Received Port of Seattle Green Gateway Awards for Carnival Cruise Line, Holland America Line and Princess Cruises' commitment to environmental excellence. Inclusion on Savoy Magazine's Top 100 Most Influential Blacks in Corporate America for Carnival Corporation CEO Arnold Donald and Holland America Line president Orlando Ashford. Together, the corporation's cruise lines operate 103 ships with 231,000 lower berths visiting over 700 ports around the world, with 17 new ships scheduled to be delivered between 2018 and 2022. Carnival Corporation & plc also operates Holland America Princess Alaska Tours, the leading tour company in Alaska and the Canadian Yukon. Traded on both the New York and London Stock Exchanges, Carnival Corporation & plc is the only dual listed company in the world to be included in both the S&P 500 and the FTSE 100 indices.